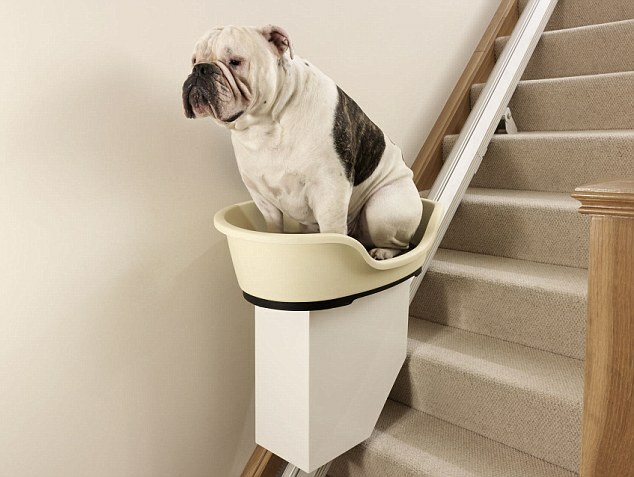 BEHOLD: the Birth of the World's First DOG Stair Lift! Stair lifts have long been associated with modes of mobility for those with problems walking up the stairs, but that is soon about to change for a whole new community: DOGS. 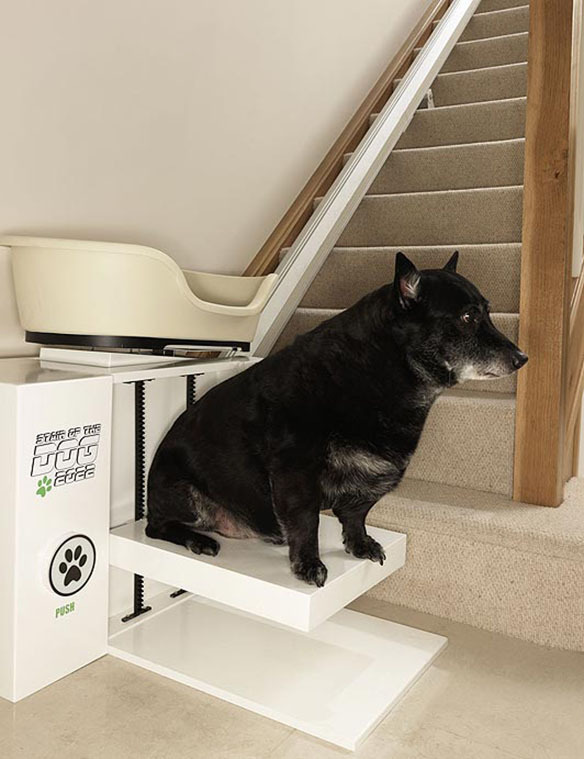 Developed for overweight dogs who have mobility problems going up the stairs, the Stair Of The Dog 2022 is a modified design based on the version for humans, The stair lift has a “paw-push” start button positioned low and close to ground level to allow pooches to outstretch its legs and activate a platform which will raise the dog up onto a plastic basket before lifting him up the stairs.The K-9 contraption was prototyped shortly after a shocking report made on pet obesity. A report made by (UK based) More Th>N Pet Insurance released a shocking report revealing that one in three of the 8.3 million dogs in the UK is overweight. The study further suggests that by 2022 over 50% of all UK dogs will become severely obese, a premise of how the device came to be named. Shortly after the release of this report, the prototype was built. John Ellenger, head of More Th>N Pet Insurance said “At the moment we take it for granted that our dogs can retrieve balls and climb a set of stairs without putting their health at risk but this might not always be the case. “We’re undoubtedly a nation of dog lovers, but time and again we see people sharing their love in an unhealthy way, mostly through feeding their dogs inappropriate and fat-laden foods,” reported the Sun. 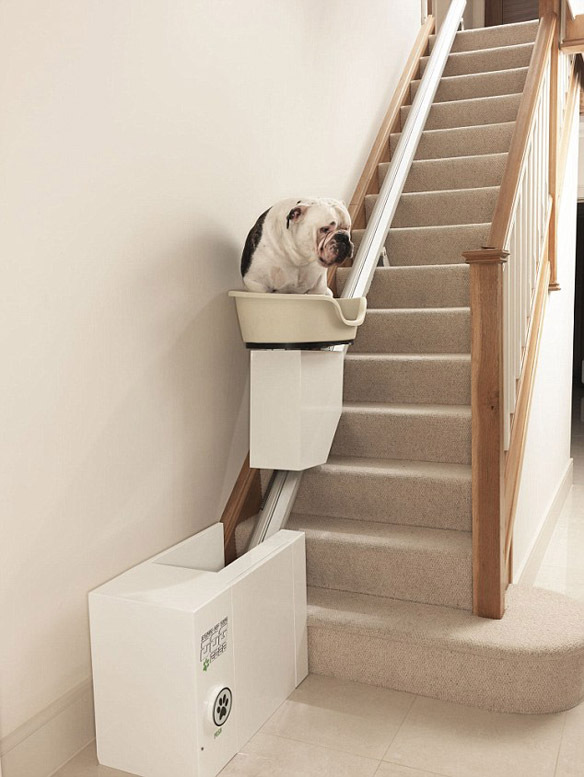 British TV vet Joe Inglis said “The stair lift for dogs is an innovative product but ultimately it’s a sad state of affairs that we’re even talking about it. “Fat dogs might look cute and cuddly but obesity is a serious issue with very serious consequences – besides restricted movement, heart disease and arthritis, it can result in liver damage and diabetes too”. Currently a prototype, this doggie stair lift is expected to set you back $8,000 (£5,000) if and when made available, perhaps a small price to pay for owners of morbidly obese dogs. You can read more on how Pet Obesity has become an epidemic on an earlier post by clicking here. You've just joined us on THE sunday funnies where each Friday we will be featuring the most outlandish and outrageously funny stories about dogs you will find anywhere! So be sure to bookmark us or subscribe via RSS at the bottom or at the top right side panel and get ready to roll out of your seat! Highland Terriers Spotted in Dynamic WaterSports! DOGS Cosplay in Pantyhose: The Latest Craze in CHINA! The CUTEST Halloween COSTUMES for DOGS 2013! Meet Nine of the World's Most Unusual DOG breeds! VIDEO: Naughty DOG Gives Sunbathers a SHOCK! Germany's 1st Restaurant for DOGS Serves Dishes Fit for Humans! Extreme DOG House Makeovers: Cribs for your DOG! Legends of Hollywood Pose with Lovable Canines! PetfoodTalk.com - Pet lovers community for reviews and coupons, submit your site to our pet websites directory.